This is the blog I first wrote on my aspirations to travel to Ireland. It was actually the first blog I ever wrote here period, I just moved it around in the timeline a little. After a lot of obstacles and what seemed like a dream that was becoming an impossible one…I finally got the news this past week that I will in fact, be going to Ireland! My company confirmed me and my mom to travel on one of our tours. It hasn’t officially been booked yet, but the approval itself was something I wasn’t sure was even going to happen. When I got the call from HR it had been approved, I actually cried. Yep, cried. It may seem like a strong reaction to something like a trip but when you’ve been dreaming of something for so long and you want to go back to your roots…to your Papa’s roots…it means a lot more than just seeing a new place, and all of that just kind of poured out of me. I called my mom immediately and we’ve been planning ever since. The itinerary is awesome. The hotels are amazing (we’re even staying in some castles!) and it’s only 6 months away. I’m so happy to be able to do this for my mom and during The Gathering year too. The year everyone of Irish descent is supposed to “return home.” I’ll finally be returning home and get to connect with a place my Papa did so long ago. So here’s to you 2013 and here’s to going home…to Ireland! I am one of Sharon’s Occupational Therapy students at Loma Linda University. I am so thankful that I was introduced to your blog. 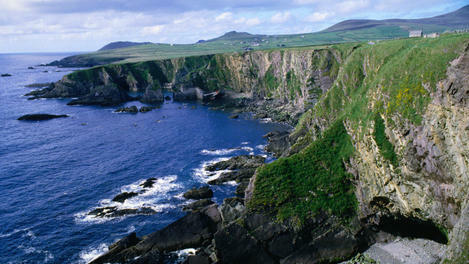 Can you tell us more about your trip to Ireland and the experiences you had? Hi Alex. Thanks for the comment and the kind words! Ireland was by far the best trip of my life thus far. Having been to Europe once before (France) I knew that I was going to be faced with more difficulties with accessibility than I would have in the US for the most part. Once I got there though, I actually found Ireland to be quite a bit more accessible than I’d thought. In the smaller towns you would find a pub or cafe that was upstairs that wouldn’t have an elevator (or a “lift” as they call it) or a place might have a bathroom downstairs. There was a day we took a boat ride to an island called Inishbofin and in order to get on the boat I had to go down eroded, mossy stone stairs with no railing. I’m still proud to this day that (with a lot of help) I managed to do that and didn’t miss out on what was one of the best days of the trip! I thought the increased walking would be hard too but I really held up pretty well and managed to not fall once (even in the rain). I was lucky to have my mom with me too. I like traveling solo because it gives me a deep sense of accomplishment but this was one trip where I was definitely glad I had someone along with me, especially with our ancestral roots tied so closely to Ireland. Aside from all of the MD-related stuff though it’s a beautiful country with the most warm and amazing people I’ve ever met. There’s still so much I didn’t see so I can’t wait to go back!